What are some of the best ways to enhance the compassionate practice of medicine? How do you make sure the culture of an institution values caring? This is the second in a series of interviews with the three winners of the 2017 DeWitt C. Baldwin, Jr. Award. We previously highlighted Montana Family Medicine’s accomplishments in humanistic care. The third interview focused on honoree Virginia Commonwealth University. By highlighting practices for teaching and implementing compassionate, collaborative, and scientifically excellent practice, we hope to share and facilitate widespread adoption of replicable humanistic education and practice. 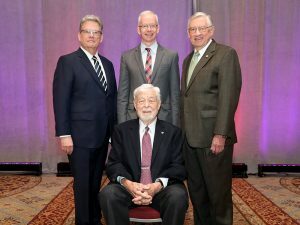 DeWitt (Bud) C. Baldwin, Jr. (seated) was present to honor Vanderbilt University Medical Center with the 2017 ACGME-Gold DeWitt (Bud) C. Baldwin, Jr. Award, along with (standing, from left) Dr. Richard Levin, CEO and president of the Gold Foundation; Dr. Donald Brady, Senior Vice President for Educational Affairs, Vanderbilt University Medical Center; and Dr. Rowen K. Zetterman, ACGME Board Chairman. Vanderbilt was selected as one of the winners of the Baldwin award. Dr. Donald W. Brady, who serves as the Senior Vice President for Educational Affairs and the ACGME Designated Institutional Official at Vanderbilt University Medical Center (VUMC), sat down for an interview with the Gold Foundation to discuss his institution’s best practices in humanistic education and patient care. He has served in his current role for over a decade, and says that the culture of compassion at Vanderbilt has been a priority at this hospital for a long time. Dr. Brady noted that it was critically important for the institution to first make an inward statement about what they believe in, and then to make those values explicit and visible to all levels of the organization. At Vanderbilt, the leadership has developed a Credo, which includes the statement “I am committed to my colleagues.” This Credo, along with the “Patient and Family Promise,” an outward promise to patients about quality care, are two value statements that are displayed around the hospital. “These visual reminders are the bedrock of coalescing our sense of community around humanism,” Dr. Brady said. He notes that it is important to recognize staff, residents and faculty members who do an excellent job of living the mission of VUMC. Vanderbilt not only gives out awards for individuals who go the extra mile for patient care, but they also give out a “team award” to celebrate groups of people who work together to accomplish something that an individual could not achieve alone. Presented at large quarterly leadership assemblies, all of these awards recognize and celebrate the embodiment of the Patient and Family Promise and the Credo. VUMC is committed to its residents. Wellness programs for residents have been a long-standing tradition, but the organization has now branched into more innovative ways to promote well-being. For example, MHAMA, the Minority Housestaff for Academic and Medical Achievement, is committed to creating opportunities for the advancement of underrepresented house staff by providing opportunities for mentorship, networking and professional development. VUMC also recognizes the importance of residents’ social support systems as evidenced by the Vanderbilt Housestaff Alliance, an organization for the spouses and significant others of current residents funded in part by the GME office. This group focuses on engaging in a wide variety of social support-building activities and community engagement. Dr. Brady spoke about how the Baldwin award has helped Vanderbilt take stock of the full range of humanistic practices that the institution offers. “Having everyone from senior administration to educational leadership to our trainees reflect on the impact of our work in humanism was helpful and served to reinvigorate our commitment to it. It benefited the whole enterprise,” Dr. Brady said. The review process for the Baldwin award also afforded the administration the opportunity to ask staff, particularly residents, about their experiences working at Vanderbilt. “Reading and learning about personal experiences of our residents was incredibly insightful, and reminds us why this work is necessary.” These institutional practices at Vanderbilt serve as excellent examples of how to do that work well.